Hi, it’s Janet with two cards using the new Stamp of Approval Adoring You collection. This is the latest SOA collection for January and it is amazing. We have a limited amount of the boxes and add on dies in stock. There are four clear stamps, one red rubber stamp and one die in this box. Even though this collection is called Adoring You it’s not too Valentine themed and can be used for lots of different cards -from birthdays to congrats and new homes. There are coordinating dies for three of the stamp sets and one stand alone die available as Add Ons. I have two videos using the Backsplash die coming soon on YouTube. As soon as I saw The Keys stamp set I knew I had to use it straight away! I have a great collection of old vintage keys (and passed this interest onto Jeni – she loves old keys too). My cards today use minimal supplies and will be linked to the shop in the supply list below. Now onto the cards. We trim all our card stock to A2 size and store them in Avery Elle storage pockets to make it super quick and easy to grab a piece of card when you are crafting. I placed the locks all over an acrylic block and stamped with Twilight ink onto the white card. I made sure to stamp over the edges of the card to make it look like this was cut from a larger piece of paper. 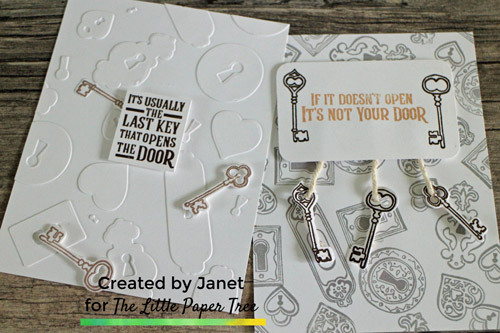 I stamped and diecut three keys on white card with Icing On The Cake to have as hanging elements. 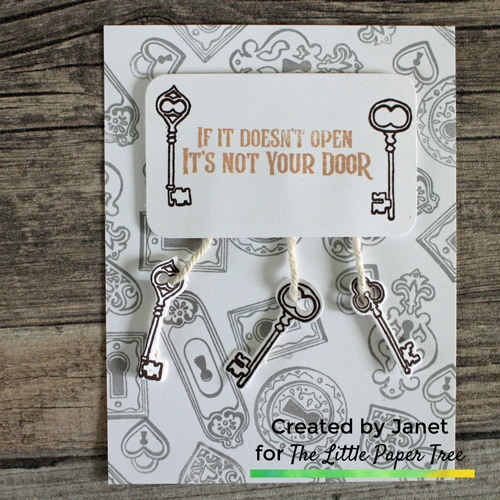 I stamped a sentiment from the same set which reads “If it doesn’t open it’s not your door” in Sand Castle ink and stamped one key image each side of the sentiment in Icing on the Cake, then cut down 8x5cm. In order for my three keys to dangle from this sentiment I used some twine and placed a thin line of scor tape on the back of the key pieces down the length of the key and pressed the twine to this scor tape. I also adhered some tape to the back of the sentiment strip. I positioned the keys where I wanted them to dangle and pressed down on the scor tape on the back of the sentiment strip to ensure the keys were firmly adhered. I placed two strips of foam tape all over the back of the sentiment strip. (Make sure your keys are facing the right way). Then adhered this to an A2 cardbase. My second card uses the dies of all the locks. On A2 CPD cardstock I die cut all the images using the dies from The Keys die (Add on) and left them unstamped and white. On an A2 sized panel I randomly adhered all the locks and keys and even the hearts and also the small pieces which cut out the key holes, remember to go off the edges so that it looks as if the page has come from a larger piece). 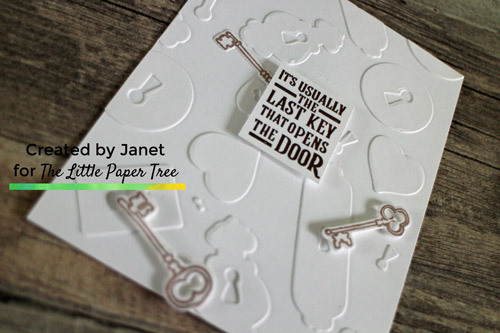 On a piece of scrap cardstock I stamped the sentiment ‘ It’s Usually the last key that opens the Door’, and cut this to 3×3.5cm. I diecut and stamped three more keys and adhered them to the panel with the locks, one to go slightly under the sentiment, which is popped up on foam, straight on the panel with liquid glue. With the other two keys I cut very thin long strip of foam tape to go on the back of the key and the key head, to give some dimension. The other two keys were them adhered to the card in a triangle (I tried to make sure the key was near a key hole). Then adhered this to an A2 sized card base. There are still some boxes and add on dies available. We’d love to see what you create with yours over at TLPTreehouse Tribe on Facebook. Use the hashtag thelittlepapertree on social media so we can find and like your projects.